Located at one of those quirky imitation Disneylands, the Phatasialand Jet operated from 1974 to 2008. Phantasialand is located in Brühl, Germany (between Cologne and Bonn). The park features a Main Street-Berlin and includes a Western ride with many gags lifted directly from Disney's Pirates of the Caribbean. Although it was called the Jet, it only cruised along at a leisurely speed of 20 km/h. The ten minute ride covered approximately 1 km. Two monorail trains operated on the loop, each with 70 seats. A third train was retired in 2001. Each six-car train was 29.7 meters long. Capacity for the ride was 560 passengers/hour. The guideway was unique to straddle systems, it was cylindrical with track "fins" attached for running surfaces. Ride quality was not all that smooth. 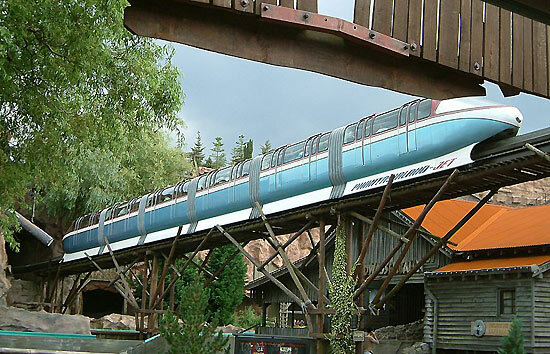 The monorail was built by Anton Schwarzkopf Company of Germany, well known amongst roller coaster enthusiasts for their twisted steel track machines. The monorail made a figure eight through the park, weaving between and through buildings. Part of the track was damaged and rebuilt as a result of a roller coaster fire in 2001. Peter Bosbach, TMS member from Wuppertal, tells us that in the 1970s there was discussion of extending the monorail to the main rail station, around 5-6 km from the park. Those plans were canceled. 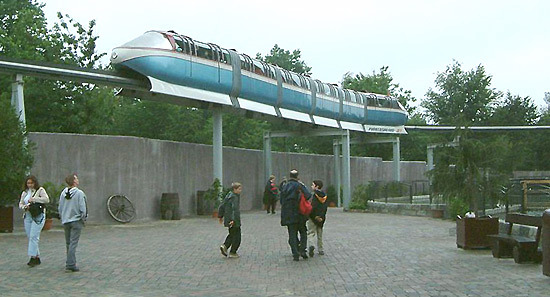 The monorail was dismantled in the winter of 2008.